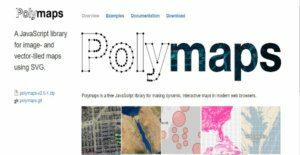 Polymaps is essentially an overlays library that users can use for Google-like WebGIS. Designed to use SVG from the ground up, PM allows powerful graphical operations such as compositing, geometric transforms and image processing. SVG also enables users to apply styling via CSS, which simplifies the development process and allows users to take advantage of CSS3 animations and transitions. The software does not use traditional JS constructors and instead, provides factory methods to internally construct required objects, which results in shorter code and faster execution. Private members can hide the internal state, making the API forward compatible and robust. Maps by default are non-interactive, but optional binding is possible using various standard interaction controls. If you are interested in Polymaps it might also be sensible to examine other subcategories of Best Data Visualization Software gathered in our base of B2B software reviews. Companies have diverse wants and requirements and no software platform can be ideal in such a situation. It is useless to try to find a perfect off-the-shelf software system that fulfills all your business wants. The intelligent thing to do would be to modify the system for your unique wants, worker skill levels, budget, and other factors. For these reasons, do not hasten and pay for well-publicized leading applications. Though these may be widely used, they may not be the ideal fit for your unique requirements. Do your homework, check out each short-listed platform in detail, read a few Polymaps reviews, contact the vendor for explanations, and finally choose the application that provides what you want. How Much Does Polymaps Cost? Polymaps is being offered free of cost to enterprises and SMBs, there are no enterprise pricing plans. We realize that when you make a decision to buy Data Visualization Software it’s important not only to see how experts evaluate it in their reviews, but also to find out if the real people and companies that buy it are actually satisfied with the product. That’s why we’ve created our behavior-based Customer Satisfaction Algorithm™ that gathers customer reviews, comments and Polymaps reviews across a wide range of social media sites. The data is then presented in an easy to digest form showing how many people had positive and negative experience with Polymaps. With that information at hand you should be equipped to make an informed buying decision that you won’t regret. What are Polymaps pricing details? What integrations are available for Polymaps? More information about integration with enterprise and business systems and apps is available from Polymaps’ official support. If you need more information about Polymaps or you simply have a question let us know what you need and we’ll forward your request directly to the vendor.